Defence Turkey: Mr. Jason Lambert, first of all we would like to thank you for your time. The contract signed between the Undersecretariat for Defense Industries (SSM) and TAI and the main sub-contractor Sikorsky and other domestic sub-contractors within the scope of the General Purpose Helicopter Program officially entered into force in June 2016 upon the completion of the efforts for USA’s export licenses. The official launch of the contract was behind the planned schedule. What was the cause of this delay? Could you briefly assess this process? Thank you for the opportunity to discuss the program. The Turkish Utility Helicopter Program (TUHP) will establish the Turkish Defense Industry as a global leader in Rotorcraft production given the unpreceded volume of technology that will be transferred to Turkey. You are correct that the official launch of the Program was delayed beyond the initial anticipated schedule. Given the TUHP scope and strategic importance, both the U.S. Government and the Turkish Government provided a significant level of oversight to ensure that the Export Licenses were structured in a manner to enable the full execution of the Program. I am pleased to say that the collaboration between the U.S. Government, Turkish Government and Sikorsky ensured that we obtained the export licenses to successfully launch the program in June 2016. These licenses will serve as the foundation for our industrial partnership which will last for at least three decades. Defence Turkey: Dear Mr. Lambert, what will be the differences between T70 configurations which will be manufactured for Turkey and the S-70 model? Could you please inform us on the configurations that will be procured by Turkey? The T70 helicopter will be a variant of Sikorsky’s S-70i Black Hawk helicopter. As the prime contractor, TAI will manufacture the T70 aircraft under a license agreement with Sikorsky. TAI will customize the T70 helicopter in two configurations, utility, and firefighting for use by six Turkish end users. Additionally, TAI will also manufacture the S-70i Black Hawk for export sale by Sikorsky to the international market. Defence Turkey: The delivery of the 109-piece lot was planned to be completed within a 10 year period. Could you please share with us the latest updates regarding the delivery of the first helicopter as well as regarding the subsequent deliveries? The TUHP contracted delivery schedule is subject to the successful completion of several conditions, one of which was securing export licenses. These conditions were successfully fulfilled in June 2016, launching the delivery calendar for the Program. To initiate the development and production of the T70, Sikorsky delivered over 185,000 pages of technical data to TAI, on-time in Q4 2016. Additionally, in Q1 2018, Sikorsky will deliver the initial kit of T70 component parts to TAI for use in the Final Assembly of T70 #1 which will begin production in Q2 2018. The first T70 helicopter is scheduled for delivery in 2021 with the 109th unit scheduled for delivery in 2026. Defence Turkey: Turkey’s demand for T70 Utility Helicopters was identified as 300 for the following 20 year period and a consensus was reached between the parties on the procurement of 109 + 191 optional helicopters to this end. What kind of a plan is on the table regarding the utilization of the other 191-piece lot which will be procured optionally in addition to the 109-piece lot? Could you inform us on the latest developments? You are correct that the initial procurement and current program of record is for 109 T70 helicopters and that options exist for an additional 191 units. TAI is licensed by Sikorsky for production for a total of 300 T70 units (109+191). Should SSM decide to procure optional T70 aircraft, these options would be added to the current program of record. Defence Turkey: According to the contract of TUHP and in line with the requirements of the institutions in Turkey, Sikorsky committed to manufacture a helicopter at TAI facilities in return for each built helicopter and to export every helicopter produced in Turkey. Within such a framework, which type of a business model will come out between the parties regarding the export of the S-70i model to third countries? On the other hand, the initial amount of helicopters to be exported was 300, is an increase in this figure possible? Under TUHP, for every T70 helicopter that TAI assembles for the Turkish end users, TAI will also assemble an S-70i helicopter that Sikorsky will purchase from TAI for Sikorsky to sell to the international market. Sikorsky and TAI will partner together to identify export markets for these helicopters. At present, the initial number of helicopters to be exported is 109 units however, that number could reach as high as 300 units depending on the T70 options exercised by SSM. Defence Turkey: Could you also please inform us on the studies conducted and plans built regarding the production line to be established at TAI facilities? TAI has built a world-class assembly facility that will be used to produce the T70 and S-70i helicopters. In preparation for the start of T70 production, Sikorsky has been providing Technical Training and Technical Assistance to TAI in the areas of Manufacturing and Engineering. Our support will continue throughout TAI’s production of the T70. Defence Turkey: What would you like to say on the responsibilities and business portions of the main contractors and sub-contractors in the development, production and integration processes? TAI, as the prime contractor, will perform the final assembly, customization, and flight test for each T70 aircraft. Additionally, TAI also will manufacture the helicopter fuselage, empennage, and composite rotor blades. Sikorsky is the main subcontractor to TAI, delivering the technical data, technical training, technical assistance, aftermarket support, and helicopter components in the form of Kits to enable TAI to build the T70 helicopter based on the S-70i Black Hawk platform. Sikorsky is also collaborating with Aselsan on the development of a new avionics suite for the T70 known as the Integrated Modular Avionics System (IMAS). IMAS is a collaborative design by Aselsan, Sikorsky, TAI and pilots serving the Turkish Armed Forces to meet the requirements of Turkish T70 operators and other potential customers. This enhanced digital cockpit will provide Turkish pilots with powerful smart displays, point-and-click functionality to speed input of pilot commands, and ergonomic enhancements to the Pilot Vehicle Interface that will reduce pilot workload. Navigational improvements tailored to Turkish requirements will include an integrated Terrain Avoidance Warning System, an integrated advanced digital map, and coupled flight control functions for guided approaches to landing zones. As you may know, in March 2017, Sikorsky transferred to Aselsan an S-70i helicopter, which was built by our PZL Mielec factory in Poland. This helicopter will be used as the prototype for the integration, test and qualification of the IMAS. After the qualification of the cockpit, Sikorsky will deliver this Prototype helicopter to TAI. Alp Aviation will perform precision machining of the T70 helicopter’s dynamic components, mechanical flight controls, transmissions and landing gear assemblies. TEI will build the engines for the T70 under license from General Electric. Defence Turkey: Which type of a plan is envisaged to increase the domestic participation level aimed for the initial 5 helicopter lot to be delivered by you and the deliveries which will follow? For the first five T70 helicopters, Sikorsky will provide kits of aircraft components to TAI for Final Assembly. Over time, as TAI and Turkish Industry increase their capabilities to produce the components, Sikorsky’s kit content will decrease and the percentage of Turkish manufactured components will increase. Our collective production schedule outlines the Turkish industry phase-in timing for the various T70 components. Defence Turkey: What are your comments on the transformation of the active cooperation within the scope of the program built with the domestic sub-contractor companies into potential cooperation in other programs in the medium and long term? When SSM developed the concept for the Turkish Utility Helicopter Program, a principal objective was to increase capability of the Turkish Aerospace & Defense industry. Sikorsky’s industrialization proposal met this expectation and we are proud to partner with the Turkish companies to develop a world class rotorcraft industry here in Turkey for the production of the T70 and S-70i. This effort is a true international industrial partnership that will set the foundation for the future. For example, in March of this year, TAI announced our recent agreement to produce airframe components for Sikorsky; and here at IDEF, we are announcing an agreement with Alp Aviation which will become the first international supplier of main landing gear assemblies for Black Hawk helicopters. These are just two examples of recent cooperation and I am confident that there will be many more examples to come in the years ahead. 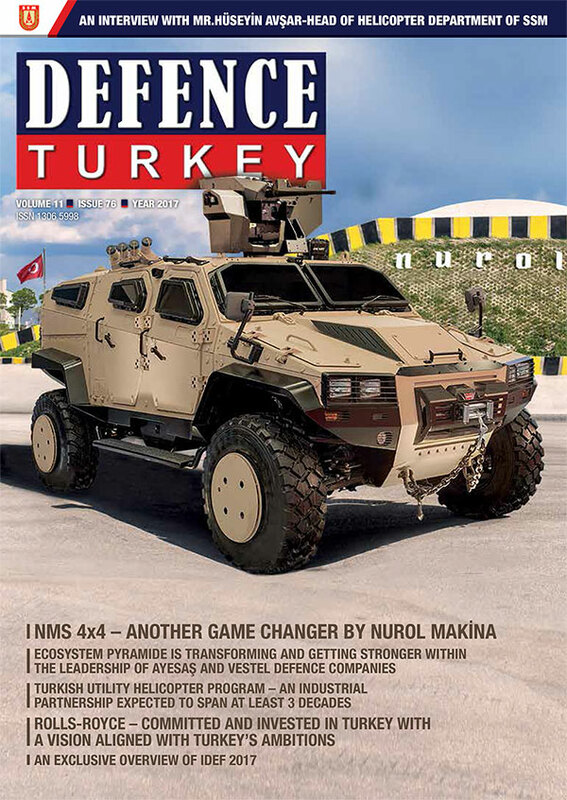 Defence Turkey: Lastly, is there a message you would like to convey to the readers of Defence Turkey Magazine? Sikorsky is now a Lockheed Martin company, following the purchase of our organization in November 2015. Since that time, the integration of the two companies has progressed very smoothly. 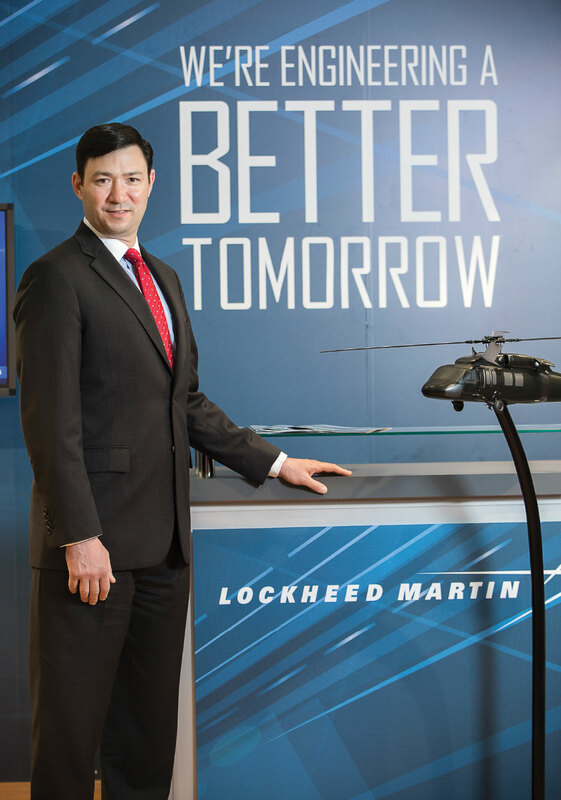 I am very pleased to say that the TUHP program has the full support of Lockheed Martin senior leadership.